July of 1999, a large alien spacecraft bursts through hyperspace and enters Earth's atmosphere, crashing on Macross Island in the South Pacific. Seeing this as a bigger threat than the current wars occupying our planet, a cease-fire is called and an official investigation is launched into a possible hostile alien threat. Macross Island becomes a bustling community of scientists researching the remains of the craft and much is learned about what would be called Robotechnology. As a better way of understanding what they have, the craft is repaired and rebuilt using what has been learned over the next few years. A permanent base on Mars is constructed in 2001 and the United Earth Government is formed in 2005. In 2009, the official relaunch of the SDF-1 (the alien craft) is scheduled with a purpose of defending the planet, finding out more about the technology, discovering what shot at the original ship and learing where it came from. Luck would have it that the relaunch would be timed well with the arrival of the Zentraedi who wish to finish the job of destroying the SDF-1. 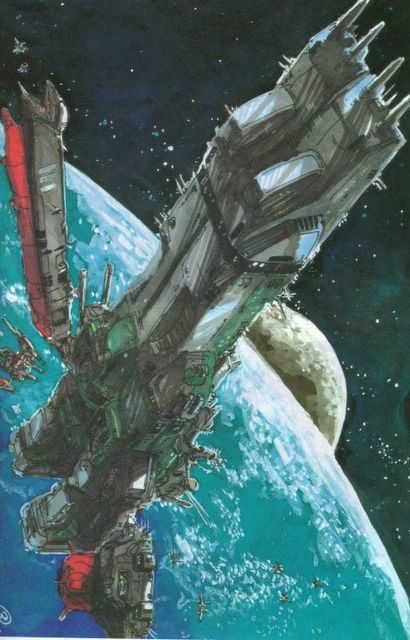 An immense beam is fired from the SDF-1 as the Zentraedi are detected on the radar (a trap which was laid by the original alien craft's occupants) and the first Robotech War begins. -- This is the beginning to what many believe to be the penultimate Japanese animation series ever created, Robotech, which first aired in the United States in 1985. It has possibly stood the test of time not only for Top Gun-ish fighting scenes or sci-fi elements but the human drama created which can only be likened to a soap opera. It is a rewarding series if you find yourself with the time to watch it.